Purina ONE Adult Salmon and Whole Grains helps Adult cats (+1 year) maintain a balanced diet and stay in great shape. The Purina ONE is formulated with yeast, prebiotics and antioxidants that help support your cat’s natural defences and immune system. 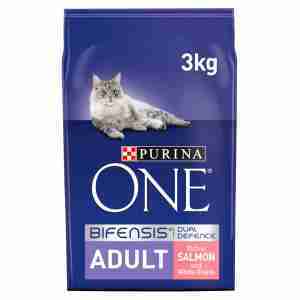 A great price for Purina One. My three cats will only eat this, and it's great to be able to order at a competitive price with the added convenience of the delivery.